Dearest Beloved, You are a radiant white pearl in this world. Your hard work does not go unnoticed. Nothing you do goes unnoticed and everything you do has a purpose. I have made you unlike anyone else. You are completely unique. You may share similarities with others, but there is none like you. And only you can do what I have created you to do during your lifetime. As the road before you is filled with obstacles, I am the only one that can show you the way around them, over them or through them. Come to me when you feel stuck and I will show you the way. When you get frustrated, come and sit with me and let me hear all about it. I already know but I want to hear you share it from your very own perspective. I love it when you share your heart with me. Be ready for my blessings because I am sending many your way. I will surprise you in the days to come with blessings you were not expecting. I want to show you my love for you in new ways. Be on the lookout for my goodness in the days to come. If you are worried about what tomorrow holds, turn to me. Keep your eyes focused on me. I know it is hard sometimes to release those worries into my hands but it is more than possible, it is absolutely necessary in order for you to feel my perfect peace. You see, if you are still holding onto your worries, I cannot fully do my work within you. Just hand your worries over to me and I will give you rest. Today, we get to walk together. Tomorrow, we get to begin anew. Every day will hold challenges and every day will hold blessings. Every day I have gifts to bless you with. Look for them and you will find them. And once you find them, hold onto them in your heart with thanksgiving to your Father in heaven who loves you so deeply. 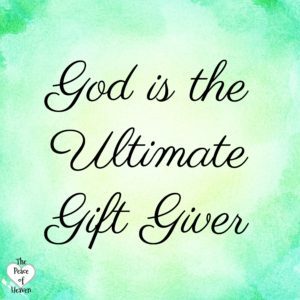 Your Father is the ultimate gift giver and His storehouses are overflowing – just for you.